Karndean Designflooring and the Karndean Designflooring logo are trademarks of Karndean International Ltd. Registered in England No. 01612506 © Karndean International 2013. 1 Download our virtual floor fitting app to your iPhone or iPad. 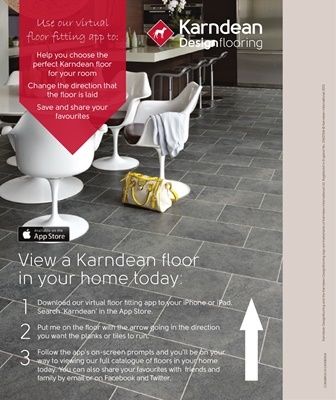 Search ‘Karndean’ in the App Store. you want the planks or tiles to run. family by email or on Facebook and Twitter.